Beal, Bob. 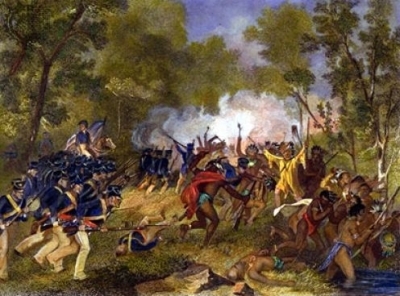 "Battle of Duck Lake". The Canadian Encyclopedia, 27 March 2019, Historica Canada. 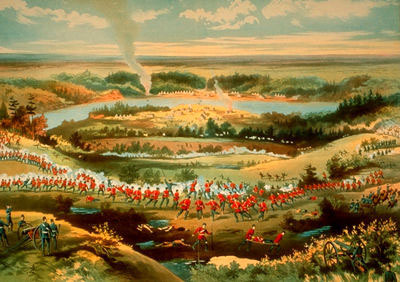 https://www.thecanadianencyclopedia.ca/en/article/battle-of-duck-lake. Accessed 24 April 2019. On 26 March 1885, the North-West Rebellion began west of the settlement of Duck Lake on the old Carlton Trail, north of modern Rosthern, Sask. Gabriel Dumont was a man of great chivalry and military skill, superbly adapted to the presettlement prairie life (courtesy Glenbow Archives). On 26 March 1885, the North-West Rebellion began west of the settlement of Duck Lake on the old Carlton Trail, north of modern Rosthern, Sask. Duck Lake was at the junction of the Carlton and Prince Albert trails, midway between Métis headquarters at Batoche and the North-West Mounted Police at Fort Carlton. The battle began at about noon when a Cree emissary and a police interpreter scuffled during a parley. The police and volunteers retreated about half an hour later. Twelve of their force of 100 were killed. Six of the slightly larger rebel force died. 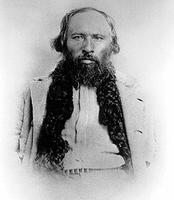 Métis military commander Gabriel Dumont was wounded; his brother, Isidore, was the first to die. A cairn now marks the eastern edge of the battlefield on Highway 212.